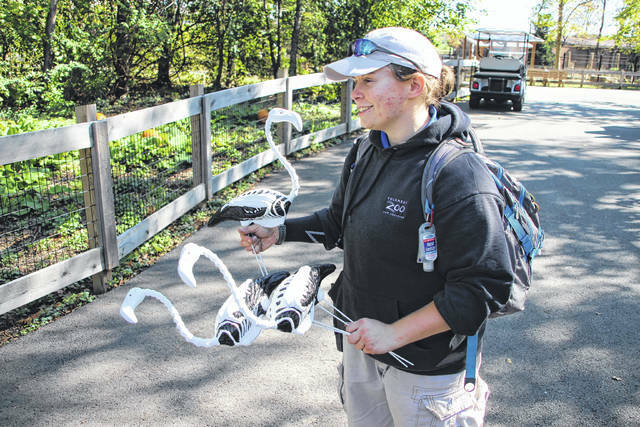 Jessie Motz, a seasonal employee at the Columbus Zoo and Aquarium, is one of the artistic forces behind some of the displays that can be seen during Boo at the Zoo. Motz, now in her fourth year at the zoo, has carved most of the pumpkins that decorate the zoo during Halloween. She is holding skeleton flamingos that will be on display. 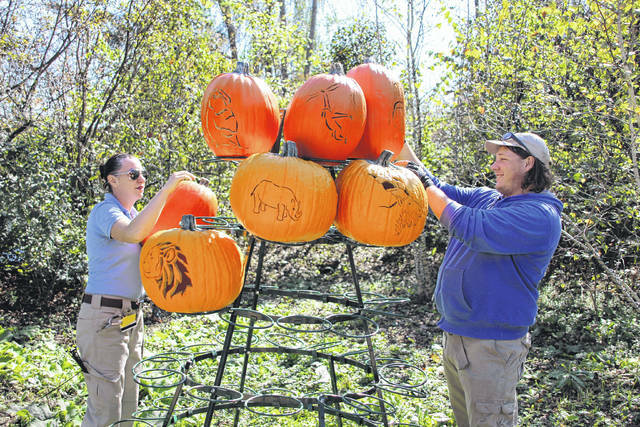 Columbus Zoo and Aquarium employees Chevy Griffin, left, and Beau Hurley build a pumpkin tree in Pumpkin Junction for the upcoming Boo at the Zoo. The annual Halloween celebration will be open this weekend and the final weekend in October. Pumpkin Junction is located in the zoo’s North America section. A “merry-not-scary” good time returns to the Columbus Zoo and Aquarium this week. The annual Boo at the Zoo opens Friday with plenty of Halloween activities ready to entertain folks young and old. Boo at the Zoo will be open from 5 to 9 p.m. each Friday, and from 10 a.m. to 8 p.m. on Saturday and Sunday during the final two weekends in October. On Tuesday, employees were busy adding the finishing touches on several displays, including Pumpkin Junction located in the North American section. Jessie Motz, a seasonal employee in her fourth year at the zoo, is the creative mind behind the “funkins.” The self-taught artist has carved a majority of the pumpkins that have been displayed in Pumpkin Junction over the past three years. She said she spends about two hours carving each pumpkin, which are adorned with figures of zoo animals. McWilliams said actors from the Otterbein University department of theater and dance will be participating in Boo at the Zoo, particularly in the Frogwortz Wizarding Academy. In addition to the wizarding activities, Otterbein students will appear in the Pumpkin Junction Best of Show performance in North America and tell spooky stories during the hayrides offered during Boo at the Zoo. McWilliams said the most rewarding aspect of staging Boo at the Zoo is the joy the event brings to the many visitors. • Batman, Wonder Woman, and Teenage Mutant Ninja Turtles Meet and Greets around Conservation Lake. • Story time with Spookley the Square Pumpkin at My House at Habitat Hallow. • Pumpkin Smash animal enrichment activities throughout the day. • Animals on Safari “Howloween” live show. • Pumpkin Junction, featuring the Pumpkin Junction Express train ride through Vertebrate Village, hayrides, pumpkin displays and presentations, Magical Pumpkin Seek-N-Find, the Oak Ridge Bears Halloween Hoedown and more in the North America region. • Sweet Stripe Stable Hay Maze. • Spooky Diver Demonstrations in Discovery Reef in the Shores region. • Frogwortz Academy Open House and Wizardry Wand-O-Wand classes in the Asia Quest region. • “Happy Family 4-D” playing daily at the Shores Park 4-D Theater. • Candy Corn Carousel rides on the 1914 Mangels/Illions Carousel. • Candy stops located all over the Zoo. • One final journey into the Jurassic Period on the Dinosaur Island boat ride before it closes for the season. The meet and greet schedule is available on the zoo’s calendar page at columbuszoo.org. All events are subject to the weather and could change.